Hands up those of you who knew that there were actually an animated Stargate TV series? Thought so . . . 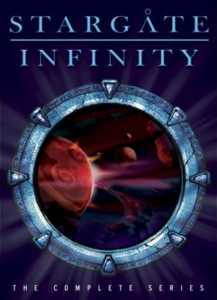 Anyway, the show was titled Stargate: Infinity and it ran on FOX on Saturday mornings between 2002 to 2003. None of the characters from the Stargate TV series or big screen movie made it to this one except for the titular stargate - basically wormhole portals that serve as a way for the heroes to effortlessly travel between various planets across the galaxy - itself of course. (Even the villains were especially created for the show, a bunch of reptilian dumb asses known as the Tlak kahn.) The group of heroes trying to foil the evil aliens' plans consists of some human teenagers and alien their alien sidekicks. The series is supposed to be 30 years after the events of the movie, but judging from the zipper suits the characters wear and the advanced technology they use it seems as if Stargate: Infinity might actually be set several hundred years into the future instead. 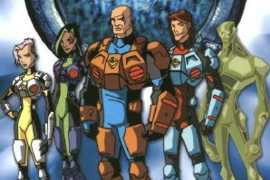 The point remains that Stargate: Infinity is typical Saturday morning cartoon fare aimed at children (or boys to be more specific) under the age of 10. It is difficult to see whether any adult fans of the live action TV show would be interested in it because it lacks the same cross-over appeal cartoon shows such as DC's Justice League or Batman have. As far as this sort of thing go, Stargate: Infinity isn't too bad even though the low budget didn't exactly allow for some stellar animation. Kids will love it ? there is enough action and monsters and stuff in it to keep things moving along. However it is unlikely that dads will sit down with their little tykes to watch it too. The sound and image on the DVDs are pretty nice however and presented in full screen mode. These four discs contain the entire series (it was cancelled after one season and never wrapped up its various plot and storylines). RECOMMENDATION: If you have small boys they will love your buying them Stargate: Infinity.